I'm sure you all think I am neglecting my family by all the layouts I've been posting lately, but I promise, I do it while they are napping/having quiet time and after they are in bed. Tonight is Stephen's night to put Hannah to bed so I've been able to work this evening. I love it! I'm having so much fun!!! So I went back in time today and scrapped my little girl with her best friends. Hannah, Darby, and Kate are practically inseparable. They have so much fun when they are together, although at times, the rule of three starts to apply. But that's usually when it's nap time and they are all cranky. I still cannot believe that they have only been friends for a year. It seems like they have been friends all their lives. I noticed that I haven't been scrapping much of Cayden. Of course, part of that is because the Summer Scrapbook is for our playgroup, but I think that I should just create a Summer Scrapbook in general. 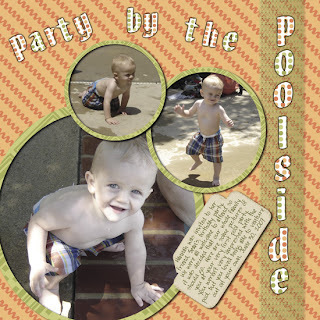 And that means I need to get more layouts of Cayden. 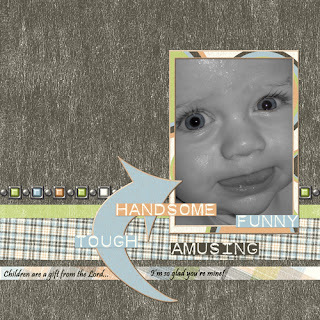 Here's my first Summer Layout of my Baby Boy: This layout was created with Madaleine Engel's kit Summer Celebration available at Scrapbook Bytes. 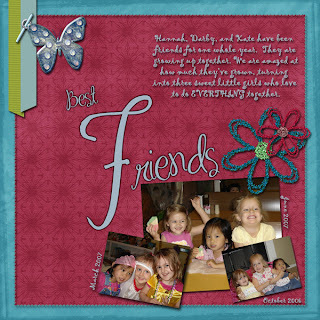 This layout was created with Jeannie Papai's Quick Page from her Boy Trouble Kit. Well, that's all. I'm exhausted, haven't been sleeping well, and have been dealing with sick and grouchy kiddos. They are much better today but still grouchy (and sleeping now! :) ). Tomorrow we are off to the fire station. But before I sign off, I must update y'all on Cayden's 3 month follow up with the allergist. In March, he was tested and found that he has an allergy to Strawberries, Tomatoes, Peanuts, Mold, and Dogs. The mold and tomato were the biggest allergies. Since then, he has been exposed to all the food items in little amounts, and he seems to tolerate peanuts in little doses. The doctor has said that we can go ahead and see how he does with peanuts. We have two different antihistamines and an EpiPen if he happens to have a reaction. Anytime he comes into contact with strawberries and tomatoes, he immediately breaks out into hives, so we will continue to avoid those at all costs. I am still nursing, which she encourages, so I pray he outgrows them. He weighs 19.8 lbs and is 29.5 inches tall. He charmed everyone in the office again with his BIG blue eyes and adorable smile. We are to continue the Zyrtec daily (for the mold and dog allergy) and give Benadryl as needed (which we've been doing) and in 6 months, he'll be tested again. This time, I will stop my allergy meds to get an accurate test for him. I was taking my meds the last time he was tested and he still had reactions, so we'll see if they get any worse. So that's it. He's a mess but I love him!